Swipe first launched 3G budget smartphone, Swipe Elite with 13-MP+5-MP Camera in India priced at Rs 5,999($99) in Black and white colour variant. Now launched it’s successor Swipe Elite 2 with 4G LTE priced at Rs 4,666. Now available through UBER from 30th Oct. to 7th Nov. 2015. It will lock horn with Micromax Canvas Express 2, Xiaomi Redmi 2 and Lenovo A6000 Plus. The all new Swipe Elite 2 is the best 4GLTE budget smartphopne supports Dual-SIM(GSM + LTE), Bluetooth 4.0, Wi-Fi, OTG Support, Micro-USB, GPS, GPRS/ EDGE, and 3G comes with a 4.5-inch QHD IPS display with resolution (960×540 pixels) and Corning Gorilla Glass 3 protection for crystal clear wide angle-view perfect for watching movies, playing games and reading e-books. Swipe Elite 2 runs on Freedom OS based on Android 5.0 Lollipop and powered by 1.3GHz Quad-core processor with 2GB of RAM, 8GB Internal memory and 32GB expandable memory promising superior user interference and blazing multi-tasking. Swipe Elite 2 also sporting a 8-MP rear Auto focus camera with LED flash perfect for shooting in low light condition and 5-MP Auto Focus front facing camera with LED flash for selfies and video calling packed with a powerful 1900mAh battery. 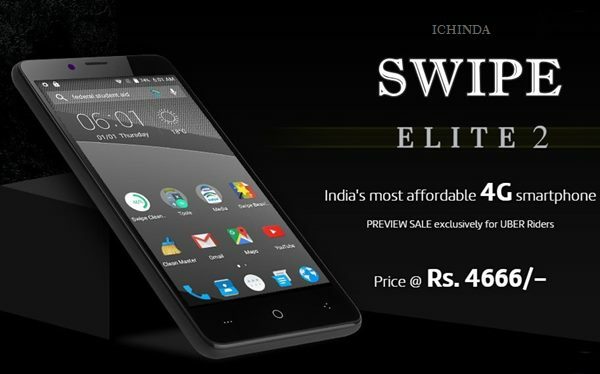 At last few Honest word Swipe Elite 2 is the best 4G budget smartphone market in India. What you think? Please be open top give your view.